“Sky Gazing” – Djs Orawan (Th) & Delorean (UK) With Influences spanning across the musical spectrum !! 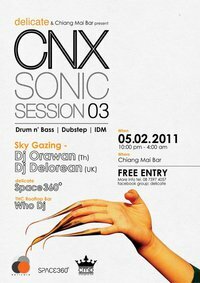 Come and support us this 5th Feb 2011…at Chiang Mai Bar. Please Feel free to join us and hope to see you there. *This event is free for all ! !